Resilient Cities, Second Edition reveals how the resilient city characteristics have been achieved in communities around the globe. The authors offer stories, insights, and inspiration for urban planners, policymakers, and professionals interested in creating more sustainable, equitable, and, eventually, regenerative cities. Most importantly, the book is about overcoming fear and generating hope in our cities. Cities will need to claim a different future that helps us regenerate the whole planet–this is the challenge of resilient cities. "The authors are selling hope in a time when fear is easy and cheap. And they find vivid ways to do so…Overall, this is a book of practical hope." "Each chapter relies on a combination of research, theory, argument, and examples to make its case, and the book manages to be detailed yet fairly concise. Each chapter is helpfully capped with a section drawing conclusions on that topic that relate directly to business, government, and communities....Completely revised and updated to address significant changes in the intervening years, the book is once again fresh and comes at a time when 'resilience' has become an urban watchword and rallying cry." What does it mean to be a resilient city in the age of a changing climate and growing inequity? In light of federal inaction on resilience efforts, how do cities create efficient transportation systems, access to healthy green space, and lower-carbon buildings for all citizens? Some of the world’s leading voices on urban issues tackle these questions and more in the fully updated and revised edition of Resilient Cities. Written by Peter Newman, Timothy Beatley, and Heather Boyer, Resilient Cities, Second Edition is a forward-thinking look at the promise of resilient cities. This edition includes updates to capture recent urban resilience and decarbonization efforts and expand on pressing topics including health and equity. The authors draw from a number of new initiatives and approaches from citizens and all levels of government, including the success of Perth in rethinking mobility options in a car-dependent city and Singapore’s Index on Cities’ Biodiversity, which has been adopted by many cities worldwide. Resilient Cities, Second Edition is filled with stories, insights, and inspiration for anyone interested in creating more sustainable, equitable, and eventually, regenerative cities. 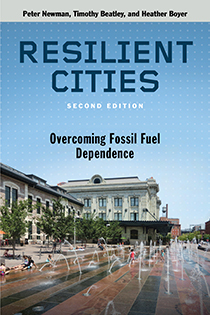 Check out an excerpt from the book and leave any questions about resilient cities in the comments below.